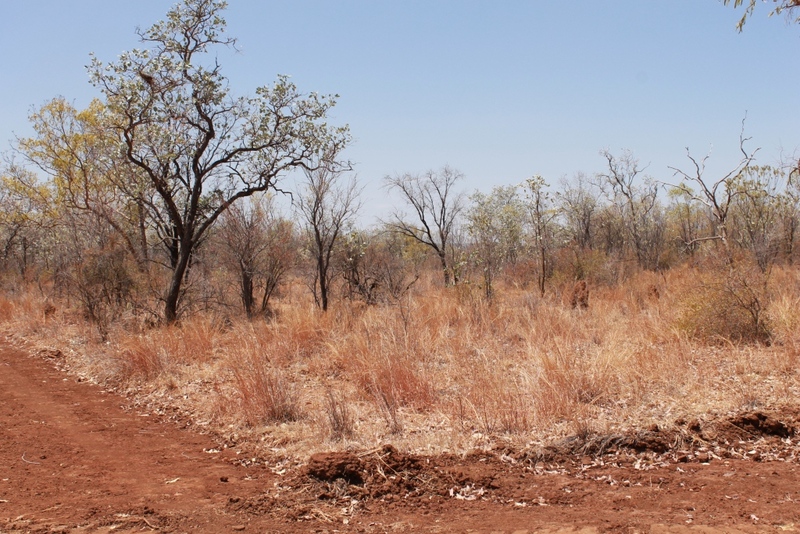 Trees and shrubs are increasing in northern Australian grazing lands. 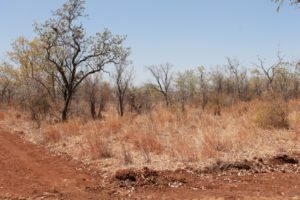 Because trees and shrubs can compete with pastures for nutrients and water, increasing woody cover can cause declines in pasture growth and livestock carrying capacity. When is the best time of the year to burn? How often does country need to be burnt? 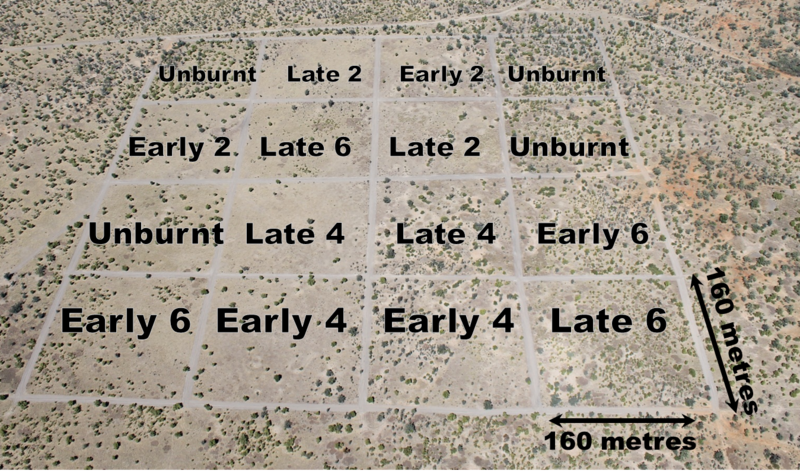 Do different land types need different burning management? The experiment consists of 2 sites, one on a black soil open grassland and one on a red soil open woodland. On each site we are testing the impact of different fire intervals (every 2, 4 and 6 years) and season of fire (early dry season in June and late dry season in October) compared to no fire, on woody cover and pasture composition. 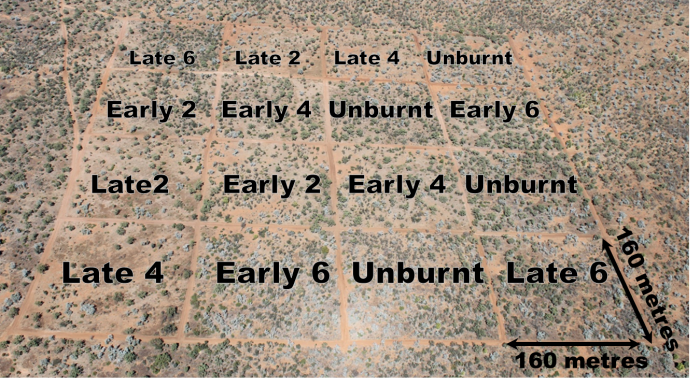 See figures 1–2 for experimental layout, and effect of treatments on woody cover as seen from aerial photos taken from a helicopter in 2013. Moderate productivity ‘red soil’ in Conkerberry paddock. Open eucalypt woodland with pastures dominated by black speargrass (Heteropogon contortus), bottlewashers (Enneapogon spp.) and curly bluegrass (Dichanthium fecundum). High productivity ‘black soil’ in Rosewood West paddock. A grassland-shrubland dominated by ribbon grass (Chrysopogon fallax), curly bluegrass (Dichanthium fecundum), silky browntop (Eulalia aurea) and feathertop wire grass (Aristida latifolia). The dominant tree species are rosewood and bauhinia. Once woody plants get taller than 2m they become very resistant to fire. Burning every 6 years is not frequent enough to arrest woody thickening. Late burns every 4 years achieve a good balance between woody management and looking after the pasture supply and land condition. Dionne Walsh and Mark Hearnden lighting the black soil site late 4 yearly fire treatment in October 2011. Burning more often, or too early in the dry season, damages your pastures unless you control grazing after burning. 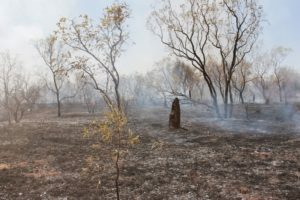 Although late dry season burns are the best, they are riskier in terms of control and you may have to spell the paddock before burning to ensure you have enough fuel at that time of year. Don’t burn unless you have enough fuel to get the result you want – you need continuous fuel loads and maximum flame height to have an impact on woody plants. Regular burning of pastures dominated by short-lived (annual) pastures is not recommended due to the risk of land degradation. Due to lower and less reliable rainfall, greater care needs to be taken when considering burning in the southern Victoria River District (VRD). To prevent animals from overgrazing small burnt areas, it is recommended that at least a quarter of the paddock is burnt at a time. You may need to spell paddocks for some or all of the wet season after burning to ensure pasture recovery. Where: Annual rainfall 740mm, Victoria River District, Northern Territory. Download a map (PDF, 658KB) showing location of Kidman Springs. Cowley, R.A., Hearnden, M., Joyce, K., Valencia, M., Cowley, T.M., Pettit, C., and Dyer, R.M. (2014). How hot? How often? 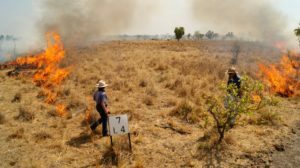 Getting the fire frequency and timing right for optimal management of woody cover and pasture composition in northern Australian grazed tropical savannas. Kidman Springs Fire Experiment 1993–2013. The Rangeland Journal. Slower than the eye can see is about woody cover change in the Victoria River District since settlement, by Darrell Lewis. 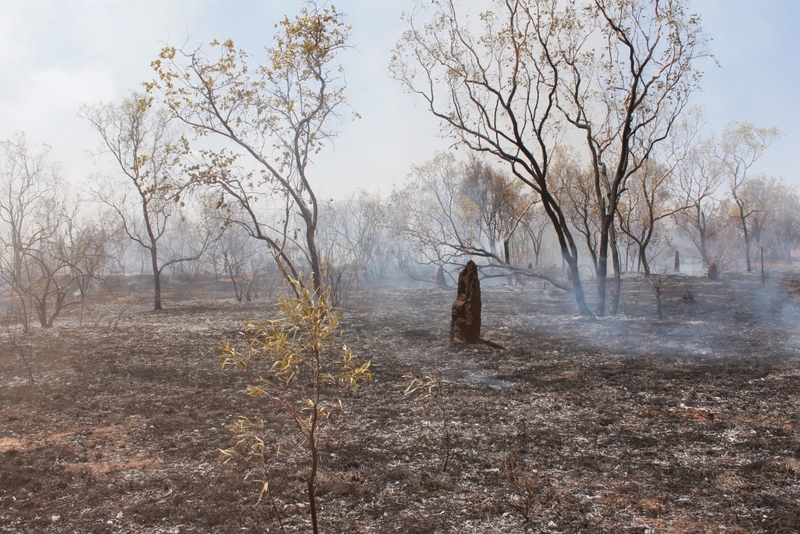 The Savanna burning book is the most detailed book you can find on how to burn and why for northern Australia. The North Australian Grassland Fuel Guide (PDF, 37MB) has detailed pictures and descriptions of fuel conditions required for burning in the Victoria River District and Sturt Plateau. Download from Charles Darwin University. Download an article (PDF, 2.3MB) on how fire frequency varies across the Victoria River District for different land types and land uses. Department of Primary Industry and Resources – Katherine Rural Review, December 2013, pages 7–9. Northern Territory Department of Primary Industry and Resources 1993–ongoing and Meat & Livestock Australia 1993–2000.